This family-run Missoni company has been at the forefront of Italian fashion since husband and wife Tai and Rosita started creating their innovative and unconventional knits in the basement of their home in 1953. Today, Missoni continues to impress with its colorful creations. Elegant eveningwear, knit cardigans, accessories and must-have swimwear are among the extensive repertoire; all under the creative leadership of daughter Angela Missoni who continues to inject renewed energy into the label's designs. In December 2005 at the New York Boutique in Madison Avenue, Estee Lauder presents the fragrance 'Missoni'. 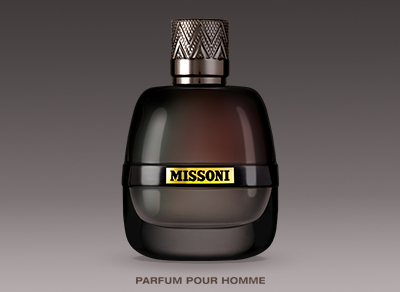 The fragrance draws upon Missoni's 50 year heritage of luxe sensuality and embraces a 'passione' for life.